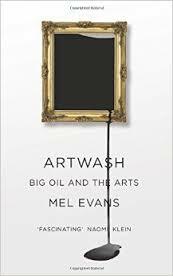 This book introduces the term ‘artwashing’, which is the process by which oil companies seek to clean up their reputations by using public arts sponsorships at major museums to garner a better reputation among circles of influence. In Artwash: Big Oil and the Arts, the author focuses on the relationship between BP and the Tate galleries in the UK, which reviewer Travis Roach finds to be an important examination, albeit with several flaws. Artwash: Big Oil and the Arts. Mel Evans. Pluto Press. 2015. Mel Evans’ Artwash was strategically released to mark the five-year anniversary of the British Petroleum (BP) Deepwater Horizon oil spill that gushed miles underground for 87 days and brought 4.9 million barrels of oil onshore. While the book’s timely release was mostly meant to memorialize this ecologically devastating event, it also arrives in the slick wake of yet another oil spill off the picturesque Santa Barbara coast earlier in 2015. While the timing of the book’s release and the most recent spill is certainly coincidental, one cannot help but feel a ping of guilt for how quickly the Santa Barbara spill has left the collective conscience. It is for this reason that Artwash serves an important purpose. Evans’ book offers an explanation of how oil companies have greased the wheels of memory and used cultural institutions to help cleanse their images and separate them from such dire events. “Artwash” is the term the author concocts to represent the process by which oil companies scrub their sullied public images by using public arts sponsorship at major museums to garner a better reputation among circles of influence. Evans connects her idea of “artwashing” with the concept of greenwashing – when firms feign environmental efforts to gain favorable public opinion – and with pink washing – when companies boast about their acceptance of gay rights. Evans notes that a number of companies, and not only fossil-fuel developers, have relied on sponsorship deals for the building of cultural capital. For instance, tobacco companies were previous ‘artwashers’. While Evans’ term is insightful, the book on the whole would better be thought of as a case-study in artwashing. This book is an insider’s view of how one company in particular, BP, has leeched acceptance by tying themselves to the four Tate galleries in the United Kingdom (UK). The broader, in-depth look at the subject is Chin-tao Wu’s Privatising Culture: Corporate Art Intervention since the 1980s, of which Evans relies quite heavily on, but her historical background on corporate sponsorship in the arts is well done on the whole. While this is an important book, and a nice step forward from Chin-tao Wu’s work, there are a number of items of concern. Foremost among these concerns is the very one-sided nature of the book. Evans belongs to the performance group, Liberate Tate, which has staged a number of unsanctioned public art protests of the very public BP sponsorship at Tate galleries. Indeed, the book begins with a vivid performers-view of a performance in which many gallons of oil-like substance were spilled at a large party, only to be sectioned off and cleaned up by the unfortunate third party of custodial staff. The author seems to relish how closely her spill mimicked the actual BP spill that afflicted the coast of the United States. While her view of the matter is important – she is, after all, an active participant in the unfolding drama and dissonance between curator, performer, artist, and visitor – she leaves little room for the reader to discover and decide for themselves the effect of BP sponsorship in the arts. Evans provides little objectivity, and presents her account as the only logical response to oil-companies making use of mostly public institutions to accumulate cultural capital and acceptance. We are left to guess how large the faction of Tate members is that would prefer to lose the small sum of money that BP donates. BP’s meager donation is in fact a central point of Evans’ book. She notes that BP provides only a small portion of the Tate museum’s operating budget, but that the familiar green and gold Helios can be seen in conjunction with almost every installation. It seems like the small injection of money from BP has immense buying power. This is likely due to the dubious connections and past-employment arrangements with BP that many of the Tate board members hold. Looking beyond the fact that BP has a seemingly inordinate presence per pound spent, Evans does a nice job of discussing the impact that the logo itself has. She notes that the rings of yellow and green cause a great deal of discord between the installation and the consuming audience, between the curator’s desires and the sponsors of that art. She writes that this palpable discord harms all involved parties; except the sponsor, of course. Although it seems that BP’s relatively small portion has been given an unwarranted amount of representation in the museum, Evans is too quick to do the same with blame for all of the negative effects of climate change and oil extraction. Surely BP is a very large producer of and distributor of petrol, but they are not the sole drivers of climate change. Really, it is the combustion of these fuels that contribute to climate change, much like it is the visitors that have travelled to the Tate galleries who also contribute, and the activist performers that have mobilized across the four galleries to demonstrate contribute. While BP is certainly not innocent, they should also not be given the entire blame for the world’s woes. I am reminded by her call to drop BP sponsorship of the many universities and organizations that have divested from fossil-fuel companies. Yes, this may help for a clearer conscience, but what larger effect does this really have? In the case of divestment, there is someone to purchase each stock that is sold, thus having no effect on fossil-fuel financing. If BP were to drop their donation to the Tate museums, however paltry the amount, would they not seek another means to the same end? Evans is right to defend her beloved Tate and to bring oil-sponsorship in the same light as tobacco-sponsorship, but it will be quite some time until another viable source can replace fuel. A much harder habit to drop than smoking I’m afraid. Travis Roach is an Assistant Professor in the Department of Economics at the University of Central Oklahoma. His research is in the areas of environmental and energy economics.